Despite the god forsaken location of Wimbly Lu Chocolates, i was certain i wanted to hunt this chocolate spot down. And yes, with the help of the GPS, nothing is really impossible. I've seen my friend tweet about this place so many times, i decided it was time for me to check this sweet spot out. The name says it all - Wimbly Lu Chocolates. Which also means you get chocolates, and what more than desserts that often come with that sinful addiction. Once in awhile we need that sweet fix, and it doesn't kill to have a cake or two - just work an extra hour at the gym later on. Eat first, think later. What sounds like an ingenious invention turned out pretty good. 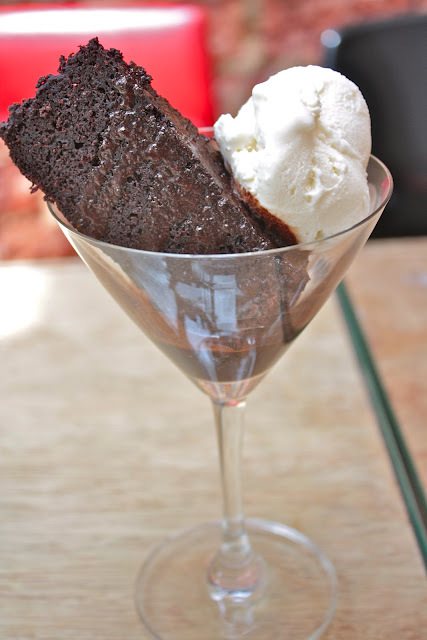 The Rootbeer Cake with Vanilla Ice Cream was served in a martini glass, along with melted chocolate at the bottom. There was a subtle taste of rootbeer in the cake, which was chocolate. I was expecting the rootbeer taste to be stronger but somehow the chocolate over-powered it. The vanilla ice cream accompaniment was good, which makes me wonder if they make their own ice cream. Unpretentious as it looks, the Sticky Date Pudding did not disappoint either. Like how they should be served, it was warm, and not overly sweet. The warm caramel sauce over the soft moist pudding came together as a whole and was a hit. I wished the portion would have been a bit bigger though. Dessert is hardly complete without waffles. We had the Waffles with Toffee Sauce and Cheesecake Ice Cream. The waffle was fluffy and well done, and the ice cream was surprisingly good. But one thing that was quite affecting was the size of the ice cream served (which is actually a ping pong ball size). Also, the toffee sauce wasn't as good so we requested for maple syrup to add on. Besides the size of the ice cream that was a tad too small, the prices at Wimbly Lu Chocolates are quite reasonable. Desserts range from SGD 4.50 - SGD 8.50, depending on what you order. The portions are not huge, which also means you get to eat in moderation. Now you know where to head after dinner.